President Michael D Higgins with Glen Hansard (right), who took part in music special recorded at Áras an Uachtaráin. Hansard is currently touring in Australia. President Michael D Higgins has reached out to Irish emigrants pushed out by the recession in his St Patrick’s Day message. He is hopeful that in the future they will return home when the economy improves as it would bring “joy” to their families. He said: “We also remember those Irish citizens who have been separated from their homeland through involuntary emigration and may not be able to visit home this year. “I wish you, in particular, a happy and fulfilled time in your new countries. When economic circumstances allow and should you choose to do so, I hope that many of you will return to live and work in Ireland once again. 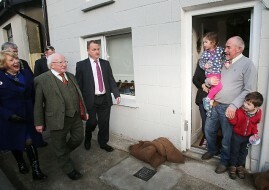 President Higgins also spoke about Glaoch, an event dedicated to Irish people around the world. Some of Ireland’s leading musicians gathered at Áras an Uachtaráin in recent days to record the show which will be broadcast on the RTÉ website. He said: “Today we celebrate together a positive Irishness and take pride in the impact and resonance of Irish culture and heritage across the world. In his speech he talked about The Gathering and invited the Irish community abroad to “join us in a year-long celebration of all that is special about our country”. And he also compared the adversities in St Patrick’s life to the challenges that Ireland is currently enduring. He said: “Like St Patrick, we are today living through our own troubling and testing times. Glaoch can be viewed here.